The Delhi units of the Shiromani Akali Dal (Badal) and BJP today condemned the beheading of two abducted Sikhs by the Taliban in Pakistan and accused the government of the country of failing to provide security to the minorities of its nation. It has just been three days the Uttar Pradesh State Road Transport Corporation (UPSRTC) launched special bus for women — ‘Sakhi’ on Delhi’s Dhaula Kuan route. Now working women of Noida have demanded more such buses for other routes as well. With the arrest of four persons— Rajeev Kumar Rai (20), Ashwani Gupta (19), Deepak Yadav (22) and Anil Dubey (23) — the Delhi police has claimed to have solved two cases of murder, including the one where a cloth merchant was shot dead in Rohini on February 14. A multi-level car parking to be built over an area of 2,143 sq mt, was inaugurated today at Pitampura in north-west Delhi. The parking would be built at an estimated cost of Rs 25 crore and is expected to get over in 15 months. Thyagraj Stadium, one of the most important competition venues of Commonwealth Games 2010, is ready for the inauguration next month, with the latest technologies and features used for the first time in India, particularly sports stadium. Reckless driving by the driver of a chartered bus resulted in the death of four persons, including two Border Security Force (BSF) personnel, and injury to nine others when the bus hit a van carrying BSF jawans in the Sadiq Nagar area of south Delhi last night. Indira Gandhi National Open University (IGNOU) in collaboration with Nagaland Gandhi Ashram is setting up an institute that would offer masters programme in social work. To provide major relief to passengers commuting to the Capital from the neighbouring town of Bahadurgarh, the Delhi Metro has decided to open its line to Mundka in a month. The 15.1-kilometer track would connect Inderlok to Mundka, which is merely a few kilometers from Haryana. With this, the Haryana government is considering the extension of Metro line to Bahadurgarh. Two British plane-spotters detained here last week have been charged with illegally intercepting communications between pilots and airport authorities. The Delhi government is likely to discuss the issue of Signature Bridge in the cabinet meeting. A 61-year-old widow was robbed of her two gold bangles by three persons posing as police personnel in the Amar Colony area of south district. The national capital woke up to a misty morning today even as sun came out later during the day. Though there were predictions of rain towards the evening, no rainfall was recorded today. A city court Monday asked the Delhi police to move quickly in the case of alleged blackmailing against Anoushka Shankar, daughter of sitar maestro Pandit Ravi Shankar, and get the required documents from the US authorities. In a true film style, a Delhi police constable not only chased the fleeing bikers, but overpowered one of them who pointed a gun towards him. Fourteen employees of Upto Date Impex Private Limited, an export house in Noida’s Sector 65, got injured when a speeding dumper truck hit the mini bus they were travelling in, last evening. The incident took place near Sector 71 crossing. A couple has been arrested for kidnapping their landlord’s child here, the police said on Monday. The 10-year-old boy was rescued by the police from a train. Three unidentified men stole cash and jewellery worth Rs.12 lakh from the house of a former professor of Jamia Milia Islamia here today, the police said. Eight criminals were arrested on Sunday on charges of robbery and chain snatching, the police said. The BJP workers demonstrated in front of the Pakistan High Commission and submitted a memorandum in this regard. The memorandum asked the Pakistan government to ensure safe release of the remaining captive youths and give protection to the minorities in the country. The delegation included O.P. Kohli, Vijay Kumar Malhotra, Nand Kishore Garg, R.P. Singh and Jaspal Singh. The demonstrators assembled near the Teen Murti Bhawan and raised slogans against the alleged atrocities being committed on the minorities in Pakistan. 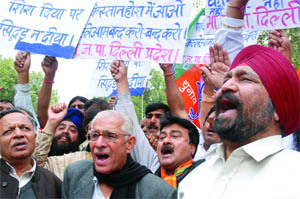 The demonstrators were carrying banners and placards with messages like “Sikh par atyachar bandh karo”, “Alpsankhyako ko suraksha pradan karo” and “Vahashi Taliban ko saja do”. Addressing the demonstrators, Kohli, president of the Delhi BJP, said in situation where members of the Sikh community were being beheaded, what was the meaning of holding secretary-level talks between India and Pakistan. The president of the Delhi unit of the Shiromani Akali Dal (Badal), Manjit Singh, said his party would ask Prime Minister Manmohan Singh to take up the issue with the highest authorities in the Pakistan government and would also write a letter to the United Nations Organisation (UNO), asking it to provide security to Sikhs and other minorities in Pakistan as the government there had failed to do so. Singh said Akali workers would also demonstrate against the killings in front of the Pakistan High Commission and that his party would try to send a delegation to Pakistan to find out the condition of the minorities there. President of the Sikh Brotherhood International, Bakshi Pramjeet Singh, also condemned the killings and said his organisation would be protesting outside Pakistani embassies in different countries. The Taliban had a few days ago kidnapped some Sikh youths and beheaded two of them. Their bodies were thrown in a gurdwara in Peshawar. The remaining abducted youths are reportedly still in the captivity of the Taliban. “A bus service should be started from Greater Noida in anti-clockwise route only then it will be more useful,” said Priti Sharma, a resident of Greater Noida who is an assistant professor at a college in Delhi. “A bus service on GL-32 route from Noida Sector-35 to Karam Pura via Connaught Place, Karol Bagh and Rajendra Place should be started, as hundreds of working women travel through this route daily,” said Shalini Gupta, an MNC employee and resident of Noida. “We have requested for a bus service for Central Secretariat via Nehru Place,” said Gayatri Sharma, a resident of Sector-37 who works at Nehru Place. Some of her friends work at Central Secretariat. “We have invited suggestions from women in the area. As per their requirement, timings and routes, buses will be plied on new routes. 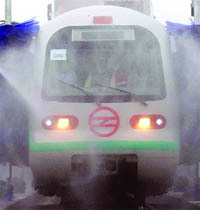 Indirapuram residents too will be able to use the service, as it is just across Sector-62 terminal,” said P.R. Belwariar regional manager, UPSRTC. The police also claimed to have recovered the weapons of offences —two 7.65mm English pistols, two country-made pistols of 315 bore, five cartridges of 7.65mm and two cartridges . DCP Atul Katiyar said the accused had murdered a cloth merchant, Davender, alias Bantoo, at his Rohini residence following an altercation. “On the day of the murder, Devender had brought home the accused and was playing cards with them. Around 8.30 pm, he was shot dead by the accused, who later escaped. However, they were seen by Devender’s daughter who told the police that one of them was named Ashwani Gupta and that he was wearing a ring in one of the ears,” said Katiyar. Based on the information, efforts were made to establish the identities of these persons and finally yesterday, the police team nabbed them from near a MCD park in Mangolpuri. “It has been revealed that while playing cards, an altercation ensued between Yadav and Davender over the game, after which Deepak fired three rounds from his 7.65 mm pistol on Davender,” said Katiyar. The officer also revealed that the accused were also responsible for killing a man in Mangolpuri on January 23. “Deepak Yadav and Anil Dubye were passing through a narrow street at Mangolpur Kalan on their motorcycle when one Gyanender objected to their passing through the street, as the road was not a through fare. Angry over the objection, Deepak fired two shots at Gyanender from his pistol, resulting in his death,” revealed the officer. The foundation stone which was laid by leader of opposition VK Malhotra, raised objections from the opposition Congress party in the Municipal Corporation of Delhi (MCD) for neglecting its leaders and councillors in the civic body's functions. "The BJP leaders invited neither area Congress MP Kapil Sibal nor Congress MLA Anil Bhardwaj at the foundation-laying ceremony while Malhotra, who has no locus standi in the corporation, laid the plaque," said JK Sharma, opposition leader in the MCD. He accused the BJP of saffronising the MCD and violating the protocol. Issuing a statement, he urged the Lt-Governor and the Chief Minister to stop payment for such functions which are being used for BJP's 'political' gains. However, Malhotra said many parking projects in the city get stuck due to delay in coordination between different government agencies while costs multiply and people suffer. "The MCD is bringing parking projects for different localities in the city, but it has to fight with several agencies for their approval," he said. Chairman of the MCD’s standing committee Ram Kishan Singhal said that clearances and approvals from different agencies take a lot of time. The indoor sports complex, which is being termed as ‘green stadium’ by its engineers, has gone the extra mile in curtailing its carbon footprints. The stadium has ceiling of recycled garbage waste, flooring of recycled PVC (poly vinyl chloride), bricks made up of coal residual, heat resistant roof and walls, solar power generation of up to 2.5 MW per day and much more. “The stadium has been built by using most innovative designs and material as we did study tours to several foreign countries before taking up the construction work and there was hardly any stadium with the advance features that we have tried to put in Thyagraj. The stadium is near completion and is expected to be inaugurated by next month,” said Anil Pundit, project manager and superintendent engineer, public welfare department. He said the stadium is environment friendly with flooring and ceiling made up of recycled garbage waste. “We have used unconventional building materials for the construction of the complex which are not only environment friendly but also cost effective. The flooring has been made with the recycled PVC (poly vinyl chloride) and the ceiling has been built of ‘false ceiling’, which is prepared by using waste paper garbage,” said the engineer. The stadium has retractable seats. “Retractable seats are those which merge into a wall with the push of a single button and with the press of the second, they again come out in the form of seats. The technology makes ample space available for the players when the audiences are not present. This technology has been used for the first time in India,” he said. Instead of red bricks made up soil, fly-ash, which is one of the residues generated in the combustion of coal, has been used in the form of bricks. “Good bricks are made of fertile soil. So we preferred to use fly-ash bricks made up coal ash, thereby saving precious soil and lot of fuel,” said Pundit. The stadium will generate 3.5 MW electricity of its own with solar power generators at the roof supplying 1 MW and underground gas turbines contributing 2.5 MW. Reckless driving by the driver of a chartered bus resulted in the death of four persons, including two Border Security Force (BSF) personnel, and injury to nine others when the bus hit a van carrying BSF jawans in the Sadiq Nagar area of south Delhi last night. According to the police, the accident took place near Krishi Vihar around 11:35 pm when the driver of the chartered bus while trying to avoid a two-wheeler hit the divider and rammed into the BSF van. A motorcycle and a scooter were also hit in the accident. All the injured were rushed to the AIIMS Trauma Centre where four persons were declared dead. Out of the eight injured, three were said to be in a critical condition. "The deceased have been identified as a BSF deputy commandant Deepak Mehra (48), constable driver Ranbir Singh (38), Sanjay (40), the pillion rider of the motorcycle and Surender (45) the scooter driver. The injured were rushed to the Moolchand Hospital, but were later shifted to AIIMS. Mehra died on the spot," said a police official close to investigation. While Surender was a resident of Madangiri, Sanjay lived in Chirag Dilli and worked with a private firm. The driver of the bus, Balwant, has been arrested. According to information, the bus was reportedly travelling in the motor vehicle lane of the BRT corridor while going from Chirag Dilli to Moolchand. On the way, at a spot near Krishi Vihar and Siri Fort, the bus lost control and jumped over the divider of the bus lane and ran into to the motor vehicle lane on the opposite side of the road. Here, it hit a BSF mini bus that was coming from Siri Fort side and going towards Chirag Delhi with eight BSF personnel. The police has registered a case and is investigating the cause of accident. "The accident seems to have been caused due to overspeeding and reckless driving of the chartered bus driver," said a senior police official. The institute, Mahatma Gandhi Institute of Education and Development, is expected to start from July 2010. The institute will house school of social work, school of agricultural development, school of teacher’s training, community college, cultural resource and training centre of Naga arts crafts and study centre. The school of social work would offer post-graduate programme in social work. Around 25 students would be admitted to the course. The aim of the centre is to contextualise the social work programme for the north east region. “The programme envisages an inter-disciplinary approach towards education and development, with thrust on preparing professionals who would help promote social welfare and development,” said Ravi Mohan, spokesperson, IGNOU. R.R. Singh, former director of Tata Institute of Social Sciences, working at Delhi University’s school of social work will coordinate and monitor the activities pertaining to the centre. To provide major relief to passengers commuting to the Capital from the neighbouring town of Bahadurgarh, the Delhi Metro has decided to open its line to Mundka in a month. The 15.1-kilometer track would connect Inderlok to Mundka, which is merely a few kilometers from Haryana. With this, the Haryana government is considering the extension of Metro line to Bahadurgarh. The Mundka line would connect 14 stations in west Delhi. The stations are Inderlok, Ashok Park, Punjabi Bagh, Shivaji Park, Madipur, Paschim Vihar (east), Paschim Vihar (west), Peeragarhi, Udyog Nagar, Surajmal Stadium, Nangloi, Nangloi Railway Station, Rajdhani Park and Mundka, all of which are elevated. Passengers can change the train for other locations at Inderlok. Initially, 13 trains would ply on the line, said a Metro official. The trains would run at a frequency of 4.30 to 5 minutes during peak hours. The travel time from Inderlok to Mundka will be 31 minutes approximately. “This will be the first standard gauge Metro line in India. The other lines opened so far are on broad gauge. In standard gauge, there is a width of approximately 4.8-feet between two tracks, while in broad gauge there is a width of 5.6-feet between tracks,” said Anuj Dayal, spokesperson, Delhi Metro Rail Corporation (DMRC). He said that it would make the Delhi Metro the only metro in the world that would operate on both tracks in one city. Mundka would also have the first standard gauge depot. Seventeen standard gauge trains having four coaches each have already arrived at the depot. The Metro has ordered 196 standard gauge trains. The DMRC has introduced several features in standard gauge trains that look sleeker. Some of the special features of standard gauge trains are — display board to inform passengers about the destination station and digital route maps on each door of the train provide information about the coming station. The trains will have higher capacity air-conditioning units along with heating and humidity control functions. The train drivers can make announcements through external speakers put on coaches. “As the distances are increasing on the Metro network, we have provided laptop and mobile phone chargers in the coaches,” said Dayal. The Delhi police today submitted a report in a city court in which the two British nationals were charged under the Indian Telegraph Act for their alleged plane-spotting activity and recording the conversation between pilots and Air Traffic Control. Police said that it has submitted a non-cognizable offence report in the court and the matter will be heard tomorrow. “Police has submitted an NCR in the court today against the two British nationals,” said Rajan Bhagat, spokesperson of Delhi police, adding that the two were not charged with any terror links. The duo, Stephen Hampston (46) and Steve Martin (55), were detained from the Radisson Hotel after the hotel staff gave a call to the police about their suspicious activities. Rajiv Awasthi, the lawyer for the Britishers, said he had moved an application in the court for the production of his clients and it will be heard tomorrow. 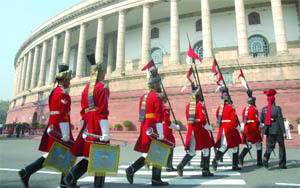 The Britishers could be fined up to Rs 1,000 as they were not accused of violating serious provisions. A case under Telegraph Act under Section 20 (read with Section four) was registered against them yesterday. If convicted, the duo will have to serve a prison term for up to three years, or with fine extending up to Rs 1,000, or with both. However, the offence which they committed comes under bailable and non-cognizable offences. Hampston and Martin were detained with hi-tech equipment used for recording conversation between the ATC and the pilot, besides high-powered binoculars. When questioned, the duo claimed that they were into plane-spotting which was their hobby. The bridge will benefit the people living in Bhajanpura, Bridge Vihar, Sonia Vihar, Nand Nagari, Burari, Mukherjee Nagar, Mall Road, etc. The estimated cost of the bridge has risen due to delay its construction. When its proposal was moved in 2002, it was decided that the construction of the bridge would be done in two phases. First the approach road and then the bridge itself would be constructed. At that time its cost was estimated Rs 459 crore. But due to misunderstanding within the authorities concerned, it was delayed raising the cost up to Rs 845 crore. Again when it was decided to start the work in 2007, its construction cost was estimated Rs 993 crore. It had to be completed within three years. Sources said that before moving the proposal in the cabinet, the department concerned has estimated its cost Rs 1,153 crore. According to police, the incident took place on Thursday when a widow Raj Rani, resident of Amrit Puri, was returning home after attending a religious function. She was intercepted by one person who asked her that a police officer was calling her. He took Raj Rani to a nearby area where one person introduced himself as a police officer and warned her that some goons are active in the area who target woman in isolated places. He then asked her to pack her gold bangles in a pocket. "The impersonator removed her gold bangles on the pretext of packing them in an envelope and in the meantime their third accomplice also appeared there who said that they will take Raj Rani to her house, though she refused. After that they handed back the envelope and left. Raj Rani was shocked as she checked the envelope and found that there was only artificial jewellery," said the police officer. A Met department official said, "The ongoing weather conditions are most likely to lead to rain in the capital. There could be thundershowers late at night or towards the afternoon tomorrow." In the evening today, the sky was again clouded, accompanied by cold winds. While the minimum temperature today was recorded at 11.5° Celsius, the maximum temperature settled at around 28.5° Celsius. Tomorrow, the Capital is likely to witness cloudy sky. While the maximum temperature is expected to settle around 26° Celsius, the minimum temperature is likely to hover around 11° Celsius. Chief metropolitan magistrate Kaveri Baweja also asked the special cell of Delhi police to file by July 30 its response on the forensic examination report of the seized laptop of Junaid Khan, who is the accused. The court directed the investigating agency to ensure expeditious response to the ‘letter rogatory’ forwarded to the US authorities for help from Google Incorporation in the case. The incident took place in east Delhi's Chander Nagar on February 20 when constable Kushan Pal heard cries of "theif, thief…" and saw two men fleeing on a motorcycle. Pal reportedly chased the two on his motorcycle. It was near Ram Nagar Extension that he collided his motorcycle with the alleged snatchers. As a result, the snatchers bike slipped beside a drain. Pal's bike was mangled. He got down and grappled with the pillion rider when the other man took out a loaded .315 countrymade pistol and pointed it at the constable's chest. "Pal left the pillion rider and overpowered the man who had pointed the pistol towards him. He then snatched the firearm," said K.C. Dwivedi, DCP (east). The arrested person has been identified as Rajesh Kumar while his accomplice, Dhananjay, managed to escape. The driver of the dumper truck was absconding till late evening today. According to the duty doctor of Satya Hospital, which is treating some of the victims, nine persons were admitted to the hospital last evening. Three of them— Ajay Kumar (28), Bala Din (42) and Mohammad Naushad Ali (32)— suffered head injuries and were admitted to the intensive care unit (ICU). The remaining six had fractures and were discharged today. 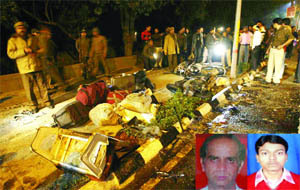 They were: Horam Singh (47), Irshad Ahmad (30), Sajid Hussain (48), Jawahar Lal (57), Abdul Sajid (30) and Thamraj Singh (18). “Beside these nine victims, three others were admitted to the Kailash Hospital and two were discharged after first-aid. We have seized the truck that hit caused the accident, but the driver is absconding,” said Babu Ram, station house officer, Sector 24 police station. “The company for which the victims work manufactures and exports fashion accessories. The company’ mini bus was taking the employees back home,” said Ram. The couple, identified as Bali and Rahul, was held on Sunday night, said deputy commissioner of police (Gurgaon) Anil Dhawan. According to the police, the duo abducted the boy from outside his Patel Nagar house here on Saturday. The boy’s father is the owner of a bakery. “Soon after kidnapping him, they called the boy’s father and demanded Rs 6,00,000 as ransom. They asked him to come to the Gurgaon railway station. They later asked him to board the train going towards Ajmer,” said Gurgaon police commissioner S.S. Deswal. The couple then asked the father to drop the bag of money at a nearby crossing. But a police team stopped the train by pulling the chain and traced the kidnappers through their phone details. “The boy told us that the couple took him to a movie theatre and kept him there for one hour. The interrogation revealed that they took him to a cinema hall in Palam Vihar and the CCTV footage also shows the couple with the boy,” Deswal said. The incident took place around 11 a.m. in the posh Surya Nagar locality bordering Delhi in Ghaziabad when former professor Mohini Anjum was at home along with her 27-year-old maid Gul Bahar. After entering the house, the robbers tied Mohini Anjum and Gul Bahar’s hands behind their backs and locked them in a room. Then, they stole the jewellery and cash kept in the house. “They took away jewellery worth over Rs.5 lakh and Rs.275,000 cash from the almirah. After that they broke open the locker and took away Canadian dollars worth over two lakh. The total loss might be somewhere around Rs.10-12 lakh. Final inventory is yet to be prepared,” Mohini Anjum said. Interestingly, the maid, Gul Bahar, is missing after the incident. Four criminals were arrested during a search operation in Khoda area of Ghaziabad. They confessed to having robbed a State Roadways bus in Sikandrabad in Bulandshahr district and burglary in a house in Khoda on February 8, senior superintendent of police Raghuvir Lal said. The police recovered two pistols, two knives, some cartridges as well as some cash from their possession, he added.